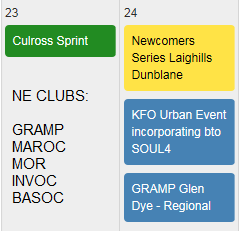 Busy year: Forest Sprints, Summer Series, Level C events, Urban etc. GMC – Dave plus 2 Ians – no issues – might move it to April? No one has yet volunteered to organise the next one…..
Would like to organise more coaching- but need someone to plan it and liaise with coaches. If you’re interested please get in touch with the committee. You don’t have to be a medal-winning orienteer just enthusiastic and we can get you some training/mentoring. It’s getting more and more expensive to run events, mainly levies on all events and Forestry Commission permissions on the larger events. Our aim is to keep the summer events at cost and on the level C events, which often have more costs attached try to make a small profit and help maintain a surplus in the account. So unfortunately entry fees have been raised …….. but we still think we are offer the best deal around. Week end away? Opportunity to do some coaching and go to big event as a club. Liz Sloan is our new Social Secretary – anyone got any ideas for club events other than curling this year? Musgrave Trophies: Carolyn McLeod – Coaching the Juniors.